Jamin was one month shy of his 11th birthday when he was diagnosed with a medulloblastoma. 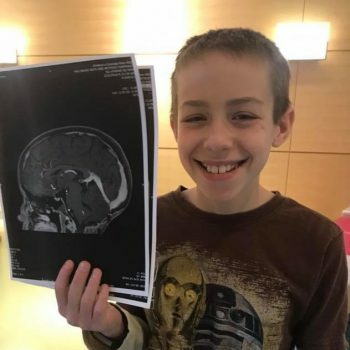 The doctors and staff at Children’s Hospital Colorado have taken great care of Jamin throughout a resection surgery to remove most of the tumor attached to his brain stem, 6 weeks of radiation, and he is currently on the second of 9 cycles of chemotherapy. Jamin has always enjoyed soccer, scouting, reading, hiking, and camping. He is a strong, thoughtful, caring young man who is learning that he is braver than he thought, loved more than he could know, and a warrior at heart. He credits God with the good things in his life and prays for other cancer warriors as well. He is looking forward to attending the 6th grade this year with all the new challenges and fun middle school affords. Jamin is excited about the chance to do robotics, take tech classes,…and being finished with treatments. The Morgan Adams Foundation hosted an amazing event that Jamin was able to attend, race RC cars, and, for a moment, forget about cancer.